Fascinating post! The introduction of bicycles isn't something I've thought about before but it makes perfect sense. I'll have to check out the book, sounds like an interesting read. This post is just the tip of (yet another) iceberg of historical information about horse-world history, and farriers in particular, that has never been well-documented. 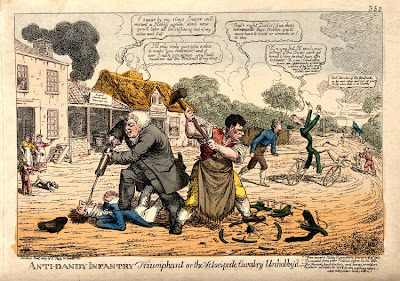 I kept stumbling on references to the "anti-bicycle movement" in old horseshoers' and blacksmiths' journals, and I didn't get it until I found the Wellcome Library's 19th century cartoon...the same time as I was looking up something in the "Horse in the City" book. That's how blog posts happen. I thought, "no one but me would be interested in farriers and vets smashing bicycles" but I'm glad I was wrong, this post is really lighting up!